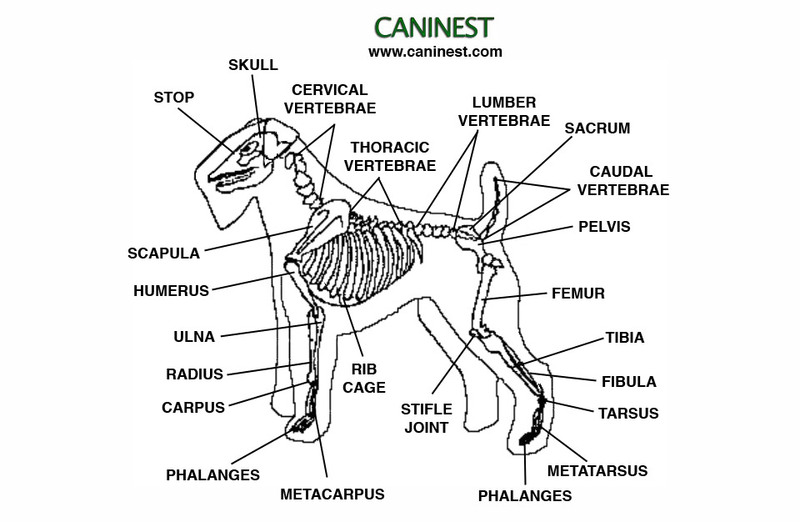 Although most dog owners do not need to know about the basic bone structures of their dog, it can’t hurt. The bony structure that encloses and protects the brain and sinus cavity in the head. The first set of vertebrae located directly behind the skull. The middle segment of the vertebral column, these are the vertebrae that carry the ribs. Run from the end of the ribcage to the root of the tail. The vertebrae that extends into the tail. A large triangular bone at the base of the spine between the two hip bones that connects with the the last lumbar vertebrae. A large bone that is the transition area between the body and limbs, connecting the spine to the hind legs. Found only in the rear legs, the femur is the thigh bone. Also called the shinbone, the tibia is the longer and stronger of the two bones in the lower hind leg. The smaller of the two bones in the lower hind leg, the fibula forms the lateral part of the ankle-joint. Also referred to as the ankle, the tarsus is a cluster of bones in the foot between the tibia and the fibula. Located between the tarsal bones and the phalanges of the toes, one belonging to each toe. The toe bones which are attached to the metatarsus bones. Equivalent to our knee, the stifle joint is only found in the hind legs and is found between the femur to the tibia. A bone and cartilage structure surrounding the chest cavity which protects internal organs from damage. On the forelegs the metacarpus bones are located between the phalanges and the carpus. The cluster of bones which connect the radius and the metacarpus. Located in the front of the forearm and connects to the carpus. On the back side of the forearm the ulna bone connects the humerus at the elbow. A long bone that runs from the shoulder to the elbow joints. The shoulder blade, the scapula connects the humerus to the neck. A dip in the skull just below the eyes and above the muzzle. 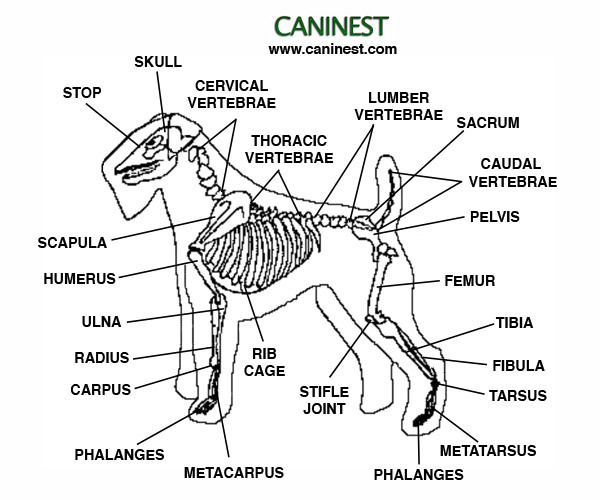 Be sure to check out basic dog part anatomy too. My dog died a year ago and the vet had never seen vertebreas with points coming out of this area across the back. I’ve been having trouble with people here, trying to get me to move so that they can make money. Is there any way they could have done something to him to cause this? He was almost always in my sight. This is very important. It took me along time time to figure this could be the problem. It is weird no one at the office had seen this before. Could they have thrown a snack in the car window or could he have been given a shot somehow that could have caused this? thanks for the ifo know i know more about dogs!